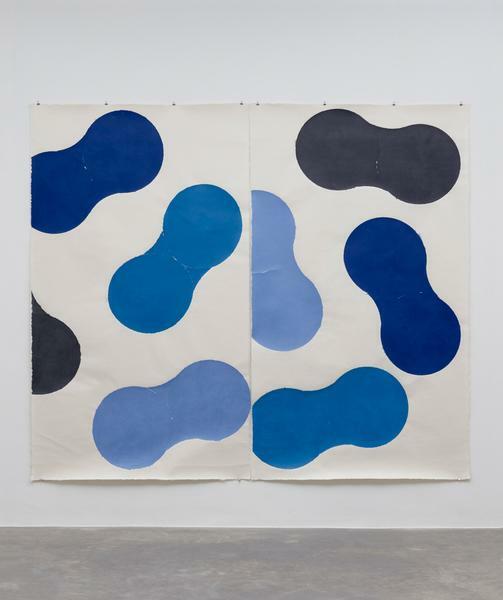 Our press officer Rosa Abbott discussing Richard Gorman's exhibition Iwano. 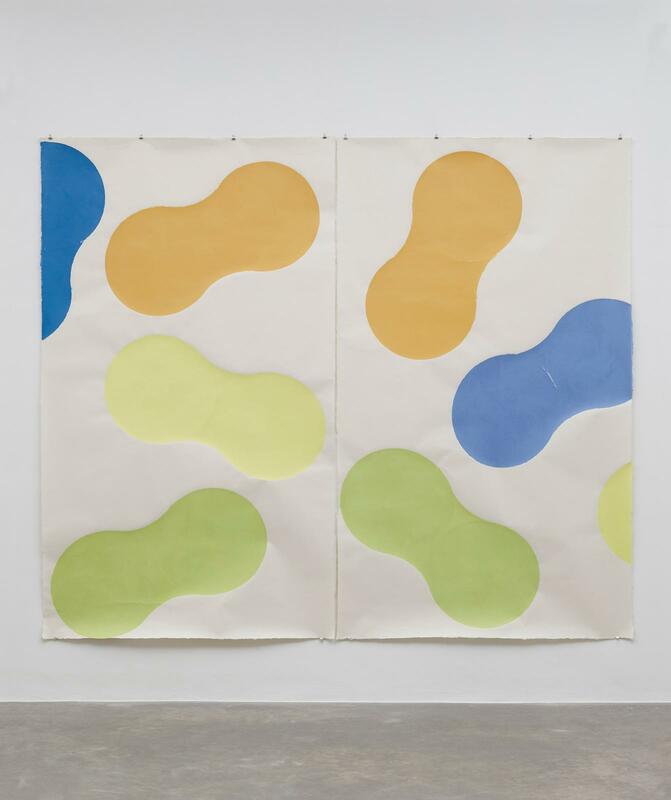 Kerlin Gallery is pleased to present Iwano, an exhibition of new work on Echizen kozo washi paper by Richard Gorman. Iwano is titled in recognition of Iwano Heizaburo, a master paper producer with whom Gorman worked closely until Iwano’s death earlier this year. Relying solely on traditional production techniques, the Iwano family has operated its paper factory in Echizen, western Japan, for ten generations. Iwano Heizaburo worked generously with the artist for more than 25 years to help produce his works on Echizen kozo washi paper, now a central – and celebrated – part of Gorman’s practice. 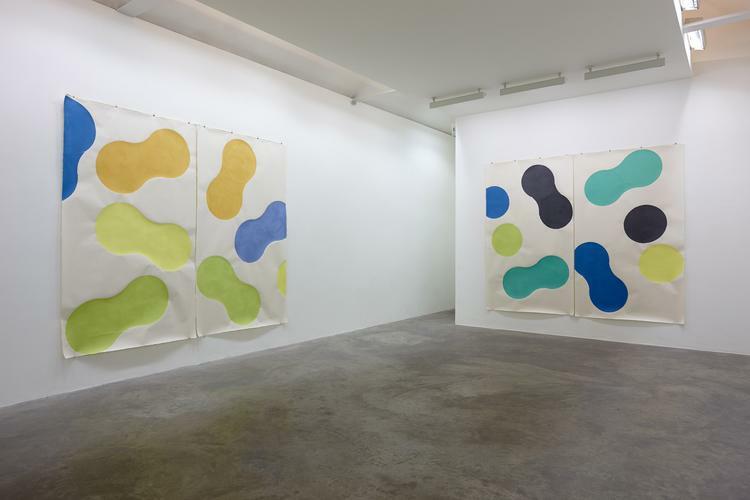 Iwano brings together a series of colourful paper diptychs, produced on an unprecedentedly large scale. Measuring 275 x 320 cm each, the works’ expanded size lends them a new monumentality, but also a delicacy and fragility; their format evoking emaki, the historic Japanese tradition of painting and calligraphy on scrolls. Each work from the series uses the same repeating geometric motif, playfully titled ‘Squeeze’, in an attuned but unexpected selection of colours, chosen, Gorman says, “not randomly, but intuitively”. Gorman’s most ambitious body of work on paper so far, Iwano is the remarkable culmination of over two decades of collaboration with the Iwano paper factory. 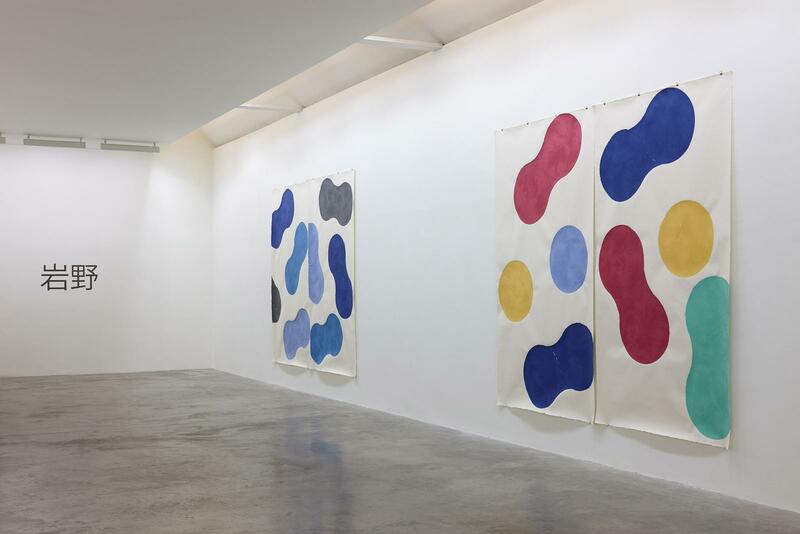 The exhibition also precedes an eventful summer for Gorman, who will mark his 70th birthday on 29 May with a major solo exhibition in Castletown House, Co Kildare. 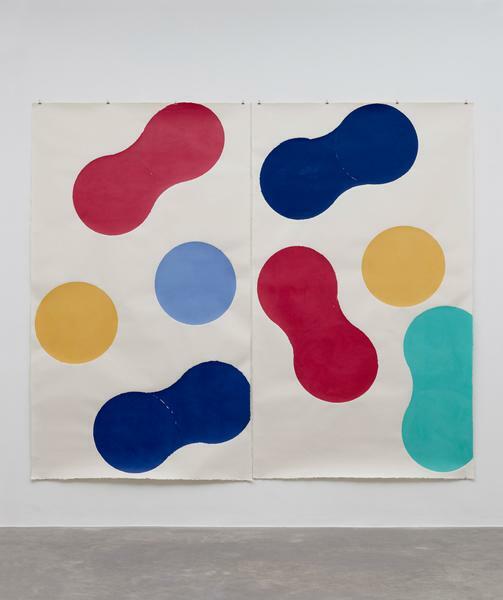 Born in Dublin, Richard Gorman has lived and worked in Milan since the 1980s and has exhibited regularly for three decades. Major solo exhibitions include The MAC, Belfast (2014); Mitaka City Gallery of Art and Ashikaga City Museum of Art, Japan (2010); CCGA Koriyama Museum, Japan (2003); Royal Hibernian Academy, Dublin and Crawford Art Gallery, Cork (2001); Itami City Gallery of Art and Mitaka City Art Foundation in Japan (1999). Gorman is represented in many public and private collections worldwide, including the New York Public Library, Deutsche Bank, the Ulster Museum and the Josef and Anni Albers Foundation. Gorman’s exhibition, Iwano, is named in honour of late friend and colleague Iwano Heizaburo, who came from a dynasty of Japanese paper makers. Painted on beautiful Echizen washi paper measuring precisely 275 x 320 cm and hung unframed, Gorman’s images, though almost minimally abstract, appear to continue the Japanese tradition of narrative scroll work. 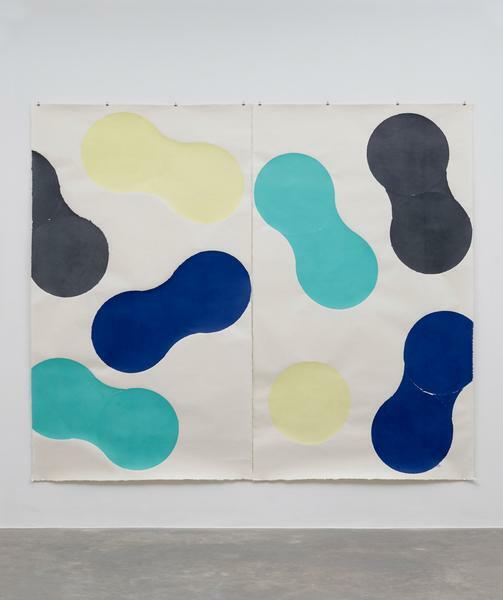 They all feature narrow-waisted amoebic blobs, sometimes punctuated by circular motifs such as oversized full-stops, as they roll around the off-white paper surface, their large scale defiantly belying an undeniable fragility. Chosen ‘not randomly, but intuitively’, as the artist says, their charm lies in their simplicity. 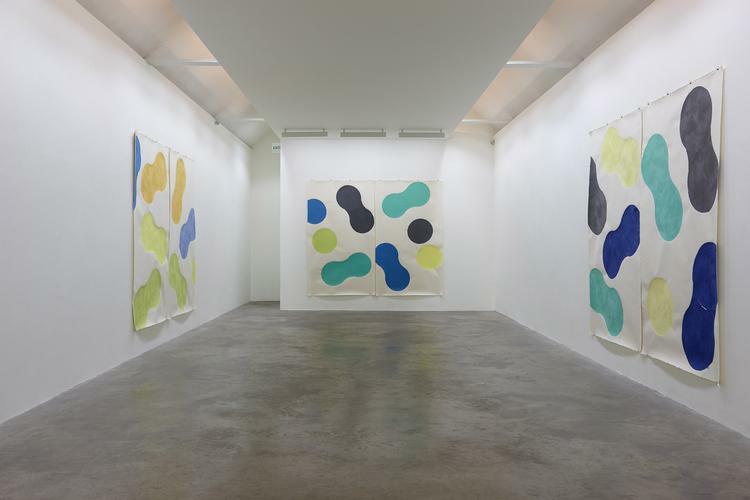 Gorman’s works are noted for their pure explorations of colour and shape, and their playful quality. A Dubliner by birth, but resident in Milan, Gorman frequently travels to Japan to work with a paper factory in Echizen, located in the rural west and so renowned for its paper factories that it also hosts a temple to the paper goddess. Iwano was a master paper producer who died at the start of this year, and the last works that Gorman made with him also happened to be his most ambitious pieces ever. All the pieces are handmade, and the colour is soaked into the pulp using moulds, lending the works even more vibrancy. 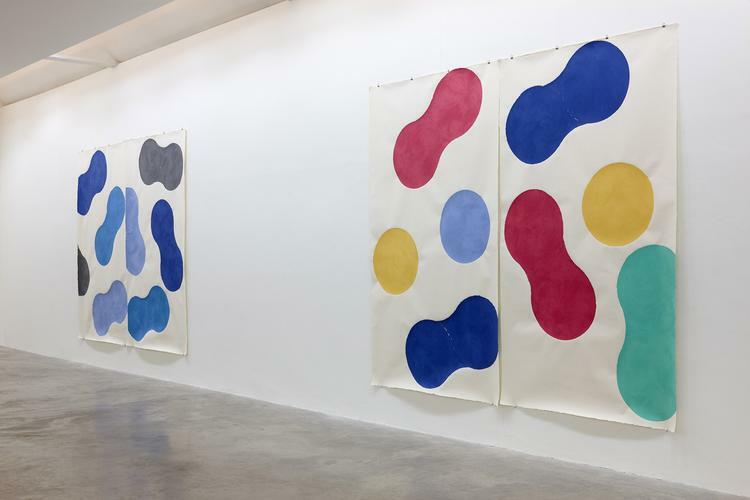 More than 25 years ago, when Richard Gorman first visited Japan’s “paper village”, Echizen, and met traditional Japanese paper-maker Iwano Heizaburo, he immediately wanted to work with the kozo paper he produced. The fibres of the kozo plant, or paper mulberry tree, make for very strong, stable paper, even as fine tissue, but its production is labour-intensive and calls for skill and experience. Gorman wanted large, robust sheets in which the texture and character of the paper were fully apparent. “I had no idea of the cost,” he recalls. Initially he thought he would buy 100 sheets and ship them back to his studio in Milan. He asked how much it would cost. “It was eye-wateringly expensive.” So he revised his expectations and ordered 10 sheets. Eventually, back in Milan, he undid the parcel. “There were 20 sheets of paper,” he says. It was an auspicious beginning for a fruitful partnership. Not only did he return many times to Echizen for paper, he developed a method of integrating the process of paper manufacture in his own work, putting himself in the thick of things at Heizaburo’s studio. As a painter and printmaker, he is know for making elegant abstract compositions of regular curvilinear forms in flat colour. Looking at the way thick sheets of kozo paper were made, he realised that he could create carefully designed dams with steel hoops and introduce areas of pre-dyed paper. In the finished sheets, in other words, the coloured areas would be an indelible part of the fabric, not applied to the surface. The results are hybrids, and he likes to exhibit them unframed so that observers can appreciate their combined painterly and sculptural character. Doing so also highlights another duality: they come across as being both strong and fragile. 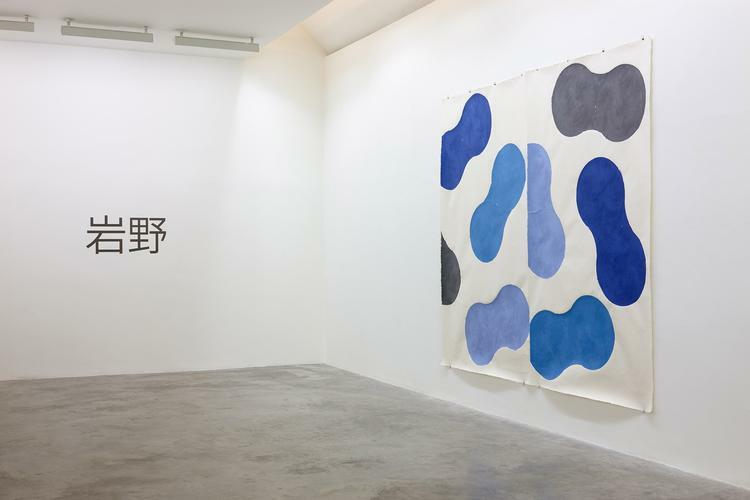 Last year, an intriguing commission led him back to Echizen to produce his largest paper works to date. In diptych format, each piece is well over 3m wide. The colours are bright and good-natured, and besides simple circles, the dominant, waisted form, which he calls “Squeeze”, has a buoyancy to it. Encountered in the gallery, the works are amazing, physically imposing yet playful in spirit.